Rep. Joel Johnson, one of the Michigan legislators behind a proposed mandatory ultrasound bill (HB 4187), recently said that the reason he feels so strongly that all women should be forced to look at photos of fetal cells they don't want to see is because ladies don't know best when it comes to making decisions about their own lives. "We have consumer protection laws for people who are getting loans, or buying life insurance," Johnson said. "It requires that things get explained to them and in my opinion this is another situation where people aren't making a decision they won't be happy with down the road." This argument raises a few questions: how does looking at a blob turn you into a more intelligent consumer of your own uterus? Why makes this man more "mentally capable" of making decisions than women who know why they should or shouldn't have a kid? (Hey, maybe he looked at an ultrasound! We hear they make you smart.) Why do politicians insist on equating women's bodies with commodities? Johnson also said he would rework the bill's wording so that it wouldn't require a transvaginal ultrasound — any will do, as long as it's not blurry, because of all those evil abortion providers who purposefully use old machines instead of, say, a high definition 3-D TV. Yes, that's actually the argument. 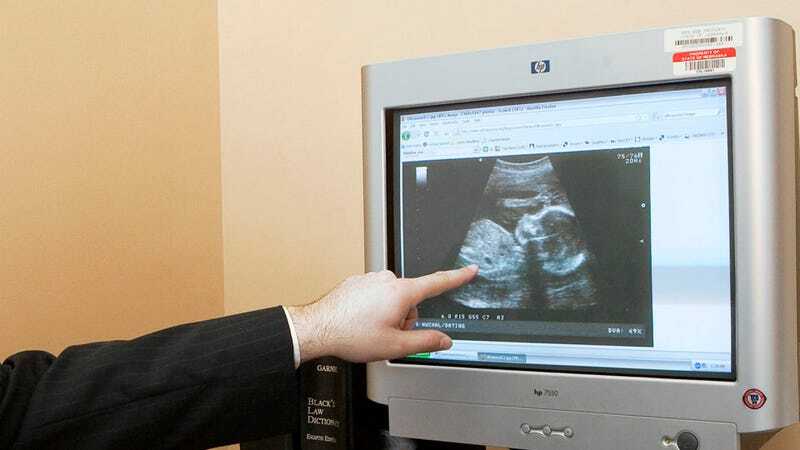 Ed Rivet, legislative director for Right to Life of Michigan, said some doctors use outdated ultrasound equipment even though they use newer machines to actually terminate the pregnancy, so the doctor could clearly see "exactly how he was going to kill that unborn child." Or maybe because ultrasounds aren't a crucial aspect of having an abortion and therefore shouldn't be mandated by law.